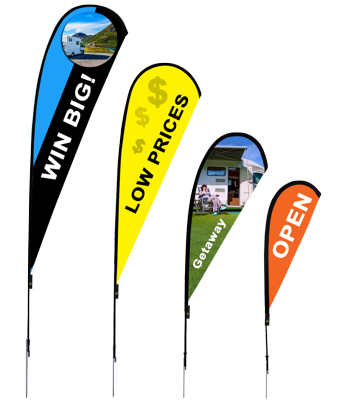 We offer 11 Different Sizes and Styles of Feather Flags - Available for Indoor or Outdoor Use! 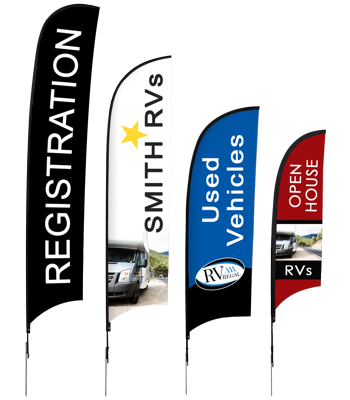 Feather flags are one of the most effective ways to advertise for your RV dealership! 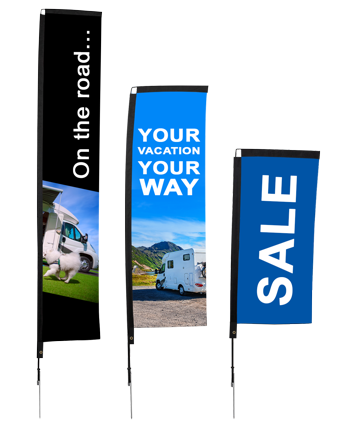 They can be used for grand opening events, sales events, rental deals, RV shows, and more! Our feather flags are printed on our mirror fabric, our lightest weight fabric that we offer. All flags are printed using a direct dye sublimation printing process. This means that the ink goes through the fabric rather than sitting on top of it. This creates an eye popping display. We also provide a variety of bases for our flags. Feather Flag Design Templates - Download the Artwork Template to Create your Designs! If you would like to design your own feather flags, you can download our template and upload it. We will check the artwork and send you a proof to verify that everything looks ok before we will send the order into production. You have your choice of flag bases, depending on what type of feather flag you order. If you have any questions about our feather flags, please contact our customer service team! All of our customer service representatives are trained graphic designers, so if you need help with your artwork, we can help!